If you have a dog that wanders around the house on a regular basis, you may want them to stay out of certain areas. In some houses, you may be able to close doors to prevent your dog from getting into areas that are off-limits, but with others, you need some kind of barrier. That’s exactly where the dog gate comes in. A dog gate is a temporary fence that you set up in your home to prevent your dog from entering or leaving a specific area. In this buying guide, we will be looking closely at all of the different factors that go into buying a dog gate as well as some of the best ones currently on the market. These are the top five dog gates that are currently on the market. Each of these has their own advantages and disadvantages, but they all have winning features that you will like and they are all high-quality gates that are going to do the job. The one that you choose will depend upon the type of dog that you have and what your specific needs are; but any of them make a good buying choice. This super-wide adjustable gate from Regalo is simply one of the most versatile and useful dog gates on the market. This dog gate is made for any size openings in your home and it will fit almost anywhere. You can block off whole rooms or cut off extra wide entrances thanks to 8 24-inch panels that lock together to expand to a full 192 inches. Plus, you can put those panels in any configuration that you want which means that you can create a space for your dog to play in or keep them in a room or out of a certain part of the house. The possibilities are endless when it comes to configuration. Another reason why this is one of the top choices on the market is how easy it is to set up. It only takes seconds to get these panels configured and ready to use, and that means you don’t have to waste time trying to fit everything together or mount your gate to the wall with complicated hardware. This gate has a convenient walk-through design but locks for safety, and it is extremely convenient to store as well since you can fold it up. This is a wall-mount dog gate as well as a freestanding one, and it takes seconds to mount it to the wall. It also features a one-touch safety lock release lever. There are so many uses for dog gates that everyone with the pet should have one. Sometimes, you want to keep your dog restricted to a specific room or area. That may be because you are cleaning, vacuuming or shampooing the carpet in one part of the house and do not want your dog to be near the equipment. It might be just a block off certain areas that can be dangerous for dog such as fireplaces and hot wood-burning stoves. Whatever the reason, this dog gate will give you enough versatility to where you will be able to use it anywhere. This is another extra-wide gate with plenty of features to help you manage your dogs inside of your house or in your business. This is an extra wide walk -hrough pet gate that is completely chew proof; featuring all-steel construction that is sturdy and durable. These will not only stand up to larger dogs that are pressing up against it and are trying to push through it, it will also last for a very long time. You don’t have to mount this with any sort of permanent fixtures or hardware, because this pressure mount system is extremely easy to install in leaves no marks behind. It stands 30 inches tall which is enough for almost every dog out there, and it is perfect for openings that are between 29 inches and 37 inches. It is expandable, which makes it an extremely versatile gate, but it is made for openings so you are not going to be able to block off more than very wide doorways. For example, if you have a combined dining room and kitchen, and you want to keep your dog confined to the dining room side, this is probably not going to work because the space that divides the two rooms is too wide for this dog gate. You can also set this up with a small 10 by 7 locking door to allow small animals through all keeping everyone else out. You don’t need any tools to set this up either, because the pressure mount system is so simple that you will be able to figure it out and have it up in just seconds. The bottom line is that if you’re looking for an expandable gate at a great price that will work on any of the doorways in your house then this is the perfect solution. The extra door for cats and other smaller pets is a really nice feature as well. All in all, this steel, expandable dog gate is one of the best choices out there for those who need something to block doorways in their home. This is another gate from Regalo, and you will absolutely love it because it does triple duty. First of all, this gate will keep your dogs in a certain area, even if they are extremely large dogs. That’s because this gate is extremely tall. In addition, this will keep most cats within an area; although cats can jump really high and they don’t really like being restricted to a specific zone. However, the best part of this gate is that it will work for children too. 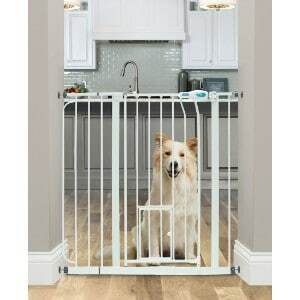 In fact, this gate is marketed as a toddler gate, but the good news is that it works for pets just as well and is a solution for pet owners of large pets that have had trouble finding a gate that will work. Some of the features that this dog gate has included are extra inches on the top with a total of 41 inches in height. It expands to fit openings between 29 inches and 37.5 inches and it is a pressure mount design that isn’t going to damage your walls in any way or require any hardware or tools to install. You can block off stairs, the room where your fireplace is located, kitchen or any other room in the house in just seconds. That’s thanks to a six-inch wide extension kit that you can install to fit any doorway in your home. You can quickly move it if you need to go through and it folds up for storage. This is also extremely durable dog gate that is made of 100 percent steel, making sure that your dog or anyone else is not going to have the press on it and break it to get through. However, the materials used in construction also mean this is going to be one of the longest lasting gates that you have ever owned. This gate also features a safety lock and it is recommended for children 6 to 36 months old and pets of any shape or size. PETMAKER makes this foldable, free-standing, wooden pet gate which is not only one of the best pet gates out there when it comes to value, but it is also one of the most beautiful and stylish with four different wood types that this is offered in including dark brown, mahogany, rich espresso and white. This gate is so packed with features that you will easily want it in your home starting with how convenient it is to store. This is a lightweight and foldable doggy gate that is compact enough when folded up that you can easily fit it in the corner of your closet. Plus, this gives you the best of both worlds when it comes to style and functionality. You can have a gate that keeps your pet from other areas of the home effectively without having to compromise on the look and design of the gate. This beautiful wooden gate comes in four different wood types so that you can get the one that blends in perfectly with your other decor. Unlike the typical plastic or composite material pet gates, this gate is made out of durable, long-lasting wood that will not look out of place around contemporary furnishings or a room with an elegant design. You also do not have to worry about installation, because this is not a traditional gate and it does not have traditional installation requirements that could damage your walls or molding. This is a simple accordion design that you can install anywhere, and it is still sturdy enough to keep out heavy dogs or small children. You don’t have to worry about drilling holes; all you have to do is set it up and forget it. Finally, the manufacturer is so committed and certain that you will love this gate that they offer a satisfaction guarantee. They are also committed to giving you the best price possible on this product. Another terrific gate is from Evenflo, and there are a lot of great reasons to choose this budget gate over the others out there. Although this might not have as many features as some of the other recommended gates, this has plenty of them to make it worth getting. This is a classic wooden pressure mount gate that is really easy to install and has lots of things that you will love about it. One of the best features is the locking bar that adjusts automatically when you’re moving it between doorways. In addition, it comes with rubber bumpers that won’t damage walls and keep the gate in place using pressure. You also get to choose from several different colors to make sure that this wooden gate matches the rest of your home. There are four vibrant colors to choose from including pink, blue, tan and a color called new farmhouse that is perfect for anyone with a rustic theme going on with their decor. You can color match this to whatever room that you are trying to block off, including the paint on the walls in your children’s bedroom or playroom. This dog gate comes completely assembled and you can start using it right away. You don’t need any tools to attach it to the wall and you can get it ready to block entryways or doorways in seconds. This will work in any standard doorway, and the style is farmhouse as well offering warm wood tones in the colors listed as well as mesh accents. This is perfect for both children and pets, allowing you to ensure security, prevent children from tumbling down the stairs, keep pets away from the fireplace by blocking off that room and much more. 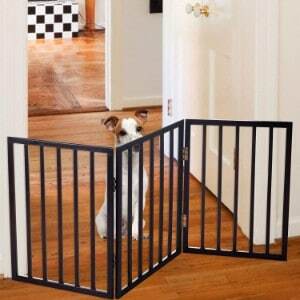 The bottom line is that this is a really amazing doggy gate, and it is really easy to use. Not only is this a really stylish and functional pet gate, it is also one of the ones that offer the most value for the money on this list. There are plenty of choices out there, but if all you want to do is block doorways in your home, this might be the perfect choice. This dog gate buying guide will help you determine what features you need from a pet gate. Dog gates can be extremely useful, and the best dog gates are the ones that fit all of the different places that you are going to be using them. Some are extremely versatile and others just block a standard size doorway. You can often use the most versatile doggy gates to create an outdoor dog kennel or an indoor dog playpen, which means that you can give your dog a space where you can put their dog crate, dog bed, dog house or dog bowl – or automatic dog feeder if that’s what you prefer to use – and it will be a place that is all theirs. But in order to find the perfect dog gate, you have to know what to look for. That’s exactly why this buying guide goes over all of the different features that you have to choose from when it comes to getting the right one. Things like the height, width and construction material are all important factors to consider when it comes to choosing which dog gate is going to fit your needs best. 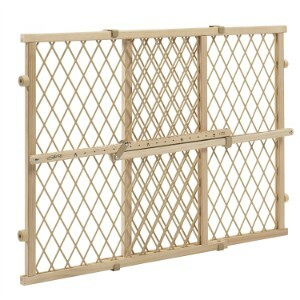 With this information, you should be able to make an informed decision to choose the perfect puppy gate for your home. First, let’s discuss some of different types of dog gate mounts that are out there. Getting the right kind of mount is important, because you will want to know how well it works and how it goes together before you buy and have to install it in your home. Pressure-Mounted: The first type of mount that we are going to discuss is the pressure-mounted dog gate. Pressure-mounted dog gates are probably the most common types of dog gates out there. Pressure-mounted gates usually have rubber at either end combined with springs that allow you to squeeze the dog ate together to fit it into the doorway. The pressure that is provided by the springs continues to press out on either side so that the dog gate stays in place and the rubber keeps it from moving if your dog comes up against it. If you want to move the gate, then all you have to do is squeeze it together again. Wall Mounted: Wall-mounted dog gates are somewhat more permanent. You actually have to install hardware next to your gate in the wall in order to get these ready to work. Not everyone appreciates this type of mount, because it can damage walls, but if you’re planning to live in your home for a long time and you are planning to use the gate for a long time, and may be worth it to have a permanent installation. Freestanding: Finally, freestanding gates are simply gates that are able to stand by themselves without any sort of pressure or hardware. You can place these gates anywhere that you do not want your dogs to go, but the disadvantage is that they can easily knock them over with a little work. There are several different materials the dog gates are made from. Whether you are shopping for indestructible dog beds or dog food containers you want to look at the construction material. Let’s look at some of the most common materials the dog gates are made from. Wood: One of the most popular materials that dog gates are often constructed from is wood. The reason for this is simple. Wood blends in with home furnishings better than almost anything else. Many people prefer a wooden dog gate because they are able to match it with the rest of their decor and make it look classy. Metal: There are several different metals used in dog gates, and the advantage of going with one of these types of metals is that the gate is stronger and more secure and will last longer than other types. For example, you may have wrought iron or aluminum gates that are going to outlast most of the plastic or wooden gates out there. Plastic: Plastic gates also have their advantages. The biggest advantage of going with the plastic gate is that they are much cheaper than wooden or steel gates. However, plastic dog gates are also not going to stand up as well to heavy dogs leaning on them nor are they going to last as long. Composite: There are also a few gates made by composite materials. Gates made up of composite materials may have the best of both worlds in some respects. However, you will have to decide for yourself what type of gate you want and what material you want them built out of. There are a few pass-through mechanisms that you will have to choose from when it comes to getting the perfect dog gate. The pass-through mechanism is the way that humans get through the gate. Some gates are very easy to get through, while others are more complicated and will require extra work. Of course, the more complex the gate is to get through for humans, the less likely it is for a dog to trigger the release. You will have to balance that out for yourself. Retractable Gates: First, there are retractable gates out there that allow you to unfasten a clasp or unlock the gate and then slide it to one side sort of like a sliding glass door. This will allow you to step through and then slide it back into place. Many people prefer this way of opening dog gates because it does not require any swing in either direction in order to walk through the gate. Swing-Open: Gates that swing are another type of gate that we will talk about. Gates that swing open and allow you to walk through them will either swing outside of the dog gate or inside. Some of them swing both ways, but most only swing a single direction. Where you place the gate will determine whether you have enough clearance for the swing, and the type of locking mechanism differs from one dog gate to another. Walk-Over: Finally, there are walk-over gates that simply allow you to step over them when you encounter them. However, these gates are only appropriate for the very smallest of dogs. They will certainly not keep larger dogs at bay, nor will they keep your cats from leaping over them. There are several benefits to having a dog gate to keep your dog in a certain area. Just as you install an electronic dog door to allow your dog outside access when you want it, or you install a dog camera to keep an eye on your pup when you are away and be able to communicate with them from work, the dog gate serves much the same purposes. The most important purpose that a dog gate serves is to keep your dog safe. Just like a toddler gate keeps your child from tumbling down the stairs, a dog gate can keep your dog from getting near a fireplace or hot wood burning stove and injuring themselves. In addition, if you want to clean or shampoo the carpet in one part of the house, it can be useful to keep your dog in another part of the house. The benefits of dog gates is that you can put them up anywhere and decide where you want your dog to stay for a while without giving him or her free roam over the entire house or having to put them outside on a leash. You can even block off certain areas permanently such as children’s bedrooms or nurseries. Now, let’s look at some of the features are out there for dog gates. Understanding what the features are and what is available with dog gates will allow you to make a much better decision when it comes to choosing one. There are quite a few things to consider, including what we have discussed above, but these are actual features that pertain to almost every dog gate out there. Let’s start with the basics. First, let discuss quality of construction. The quality of construction will depend partially upon the building materials that you use, which we have already discussed, but that is not all that goes into this factor. You can have a steel dog gate that is much more poorly constructed than a plastic gate, so you have to be aware of this construction before you buy. The way that you can determine this online is by looking at customer reviews or examining the dog gate in person. If you can look at the way that the gate fits together, including seams and fasteners, you can determine if it is the highest quality build. Height is also something that you want to consider when it comes to choosing a dog gate. A very short dog gate may work for smaller dogs, but you will need a very tall gate for the largest dogs. If you are making your gates do double duty as kid gates, then you will definitely need something that is tall enough to keep your toddlers from crawling over. Gate length is also something that you need to consider. The length of your gate will depend upon the type of dog gate that you have. For example, the ones that are designed to fit in the doorway may only have a small extension, while others may have additional panels that you can install to cover the entrance to an entire room without a doorway. How easy the gate is to use is also a consideration. You not only want the gate to be easy to set up in your doorway, you want to build a pass through easily without having to slow down for more than a second or two. This can be a difficult balance to find, so you will have to check each of the dog gates that you are considering to see which one offers ease of use the best. You also want to be concerned about the strength of the gate itself. Remember, dogs are not concerned with whether or not your gate will hold up with them leaning on it. If you have medium-size or large dogs, then it is likely that they are going to be leaning up against the gate at all times if you are on the other side of it. You want to make sure that the gate is going to be able to hold up against this leaning and last for a long time regardless. Style and color may not seem like the most important factors, but if you have already made sure that your other features are present, then style and factor can definitely be a consideration. Many people want dog gates that fit their own home décor, and the finish of a gate, the style of it or the particular color can all affect that. Decide whether you want your dog gate to blend in with the rest of your decor and then look for gates that will fit. The bottom line is that there are lots of accessories that you can get for your dog that are going to make a major impact. Getting an injured or disabled dog a dog stroller or dog bike trailers will allow them to go out and experience the world once again while accessories like a dog seatbelt and dog car seat cover might help you take your dog long distances with you. Dog gates are one of those essential accessories. There are lots of things that you want to consider when it comes to choosing the right dog gate. You need to determine the height that you need as well as the width, and then figure out what material is going to work best for you – both when it comes to how durable you want your dog gate to be and whether it fits in with the decor of your home. When it comes to choosing the right dog gate, you want to look at all of these factors together and figure out what is most important so that you can make the best buying decision possible on the dog gate that you choose.